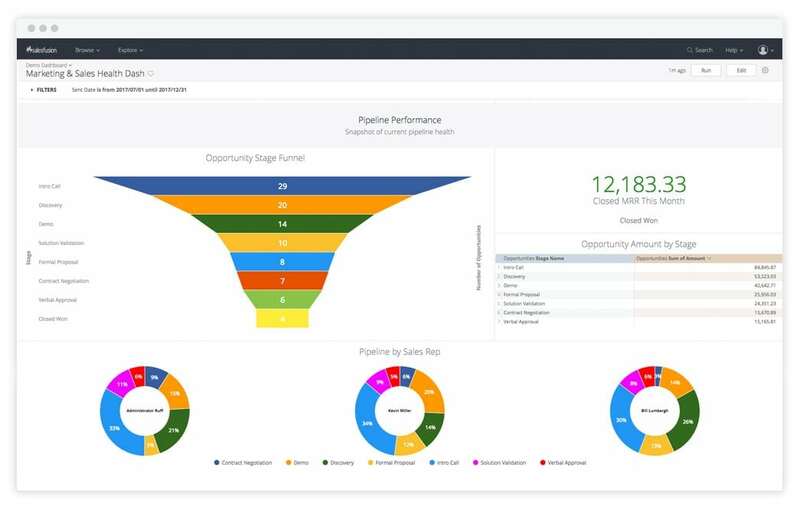 Salesfusion marketing automation software is transforming how businesses engage audiences and measure marketing success through every step in the funnel. Attract more visitors to your site and track their digital journey to learn where they interact and convert on your website. Create professional powerful marketing campaigns with the most intuitive email and landing page builders available. Deliver the best leads to Sales through robust nurture and scoring capabilities. Uncover what tactics are working and which aren’t to help you refine campaigns and improve results. Nearly 11 times more B2B organizations are using Marketing Automation now than in 2011. Salesfusion is the premier platform for improving how companies attract, engage, and close new customers - revolutionizing the way that businesses acquire new revenue. Today, Salesfusion boasts the most out-of-the-box integrations to CRM systems and is the only marketing automation software that is built on a CRM database. Salesfusion offers 100% pre-built, no-setup-cost integration with Infor CRM (Saleslogix). Salesfusion will help give your marketing team all the latest technology available to generate demand and leads your sales team. To attract new opportunities, convert them into contacts, and nurture them into lifelong relationships requires a deeper understanding of your customer's motivations. Simplify your customer relationships with Infor CRM (Saleslogix) and automate your communications with Salesfusion. 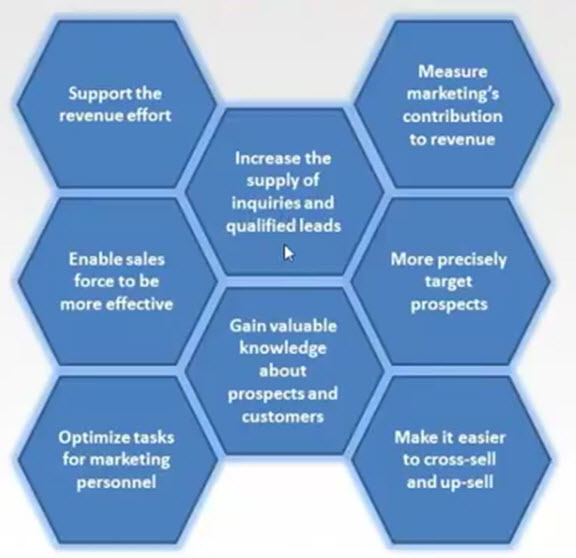 With the tightly integrated "Sales Squared" solution you can implement powerful lead-to-sales management programs. Infor CRM customers worldwide use Salesfusion to optimize the lead-to-revenue life cycle, by adding efficiency, capability and predictability to each step in the process. Your customer interactions by email, on the web, and at web events are automatically added to your contact and group history in Infor CRM. Feature rich and powerful, yet cost effective enough for SMBs, Salesfusion and Infor CRM will help your company's bottom line by giving your marketing team all the latest technology available to generate demand and leads for your sales team. small marketing teams can afford and be successful using. 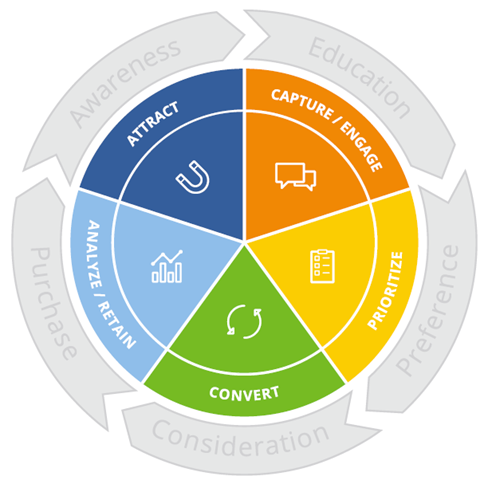 Drive inbound traffic and identify new prospects to pull into your funnel. Capture leads and nurture prospects into lifetime customers. Lead Analyzer is a powerful, yet easy-to-configure, lead scoring, routing and nurture marketing solution. 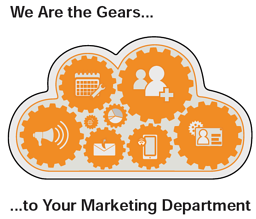 The solution connects your marketing and sales through behavioral workflow. 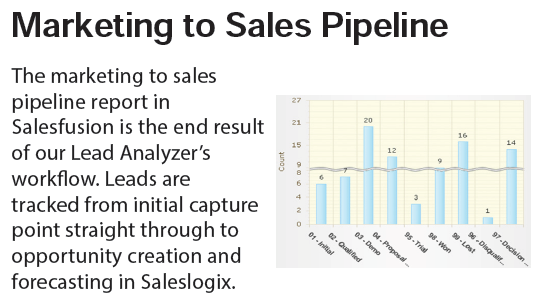 Lead Analyzer is arguably the most flexible lead scoring and routing engine in its market segment. Flexibility is built in to create as many lead scoring rules and models as your company requires to be successful. Read more about three-element lead flow.